Short Bags - Elemental Earth Short Bag - Tarot Bags, Tarot Cards, Cloths, & More! Embrace the strength and power of Mother Earth with this Elemental Earth Bag! 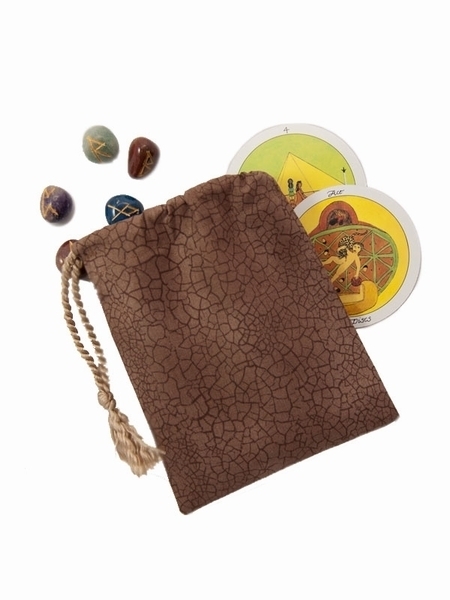 This bag will help cleanse, ground and protect your runes or tarot cards between each use. The element of earth is commonly portrayed in tarot cards as the suit of coins or pentacles. Earth Symbolism: Earth represents all that is material and tangible, like the physical body, wealth, and property. It also represents core concepts like strength, stability, fertility, and abundance. Earth is associated with the cardinal point North and is the ruling element of the astrological signs Taurus, Capricorn, and Virgo. Pictured: Element of Earth rune pouch (short bag) with a selection of runes from the 7 Chakra Rune Set and cards from the Mini Motherpeace Round Tarot (runes and cards not included). Design: Our single draw bags are a no-fuss, streamlined option for keeping your cards or runes protected. All seams are triple stitched and the drawstring opening is reinforced. See our Quality page for more details about construction.